After hours spent meandering our way through gigantic halls filled with bright lights, dodgy dubstep and exotic cosplayers at this year's Gamescom, we found ourselves taking shelter at the Wargaming booth. 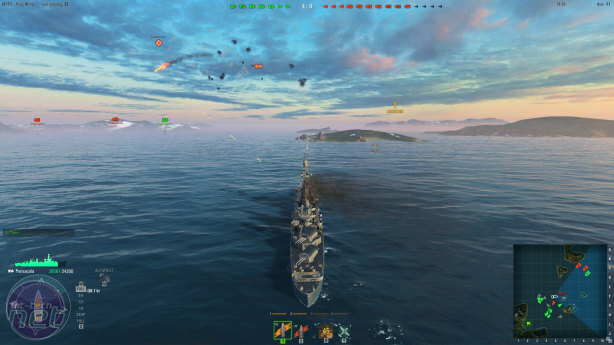 Here, we were treated to an interview with the company's CEO, as well as a playable demo of the upcoming free to play MMO World of Warships. 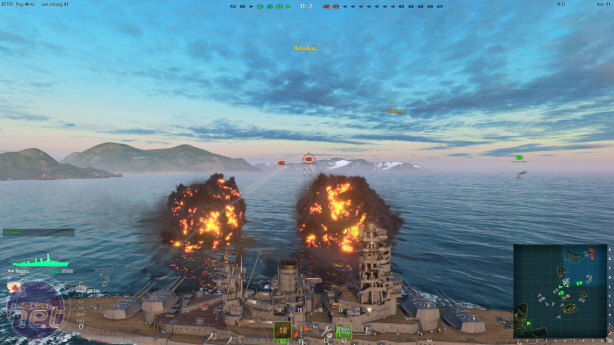 This is the third such game from Wargaming for PC users, and it follows in the footsteps of the much-loved and immensely popular World of Tanks and the still-finding-its-feet World of Warplanes. It adopts Wargaming's “free to win” philosophy, in that the game is entirely free to play, and in-game purchases are more geared towards speeding up progression – they don't give users an actual advantage on the open waters. 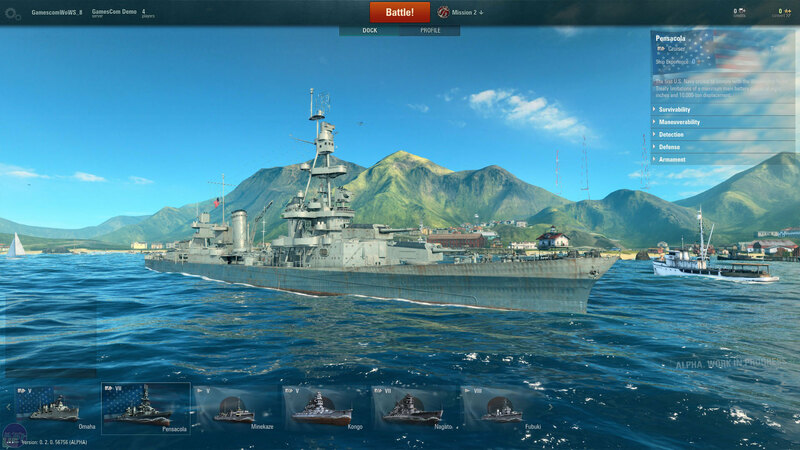 It will of course also be part of the Wargaming.net universe, with the Unified Premium Account allowing users to use the premium features of all Wargaming titles. The general format is a familiar one – players each take control of a ship on one of two opposing teams, before fighting it out for control of the high seas. 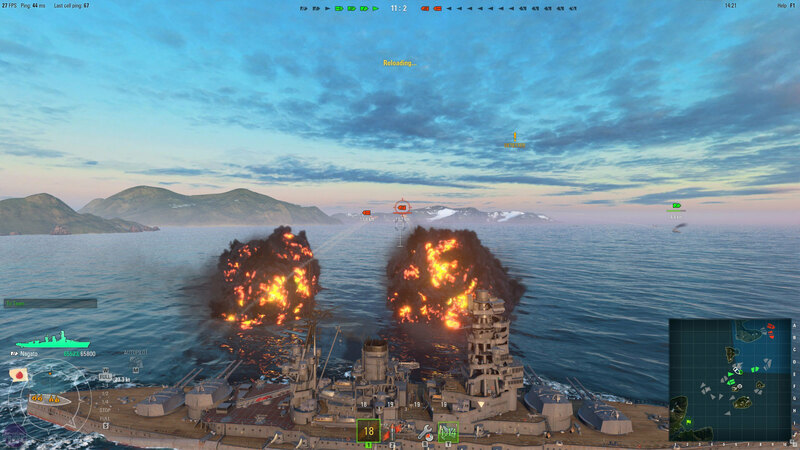 However, just as the dogfighting of World of Warplanes was very different to the ground combat of World of Tanks, the naval combat here differs by necessity, bringing with it a series of new mechanics, as well as challenges for the developers. It's early days for World of Warships, though Wargaming does currently have around 3,000 alpha testers, and is aiming to move to a closed beta stage later this year. We weren't allowed to capture any gameplay, but screenshots scattered throughout the article give you an indication of the UI, which is shaping up well. Graphically, it already looks fantastic too. The first thing that hits you is the sheer scale, both of the maps and the ships. 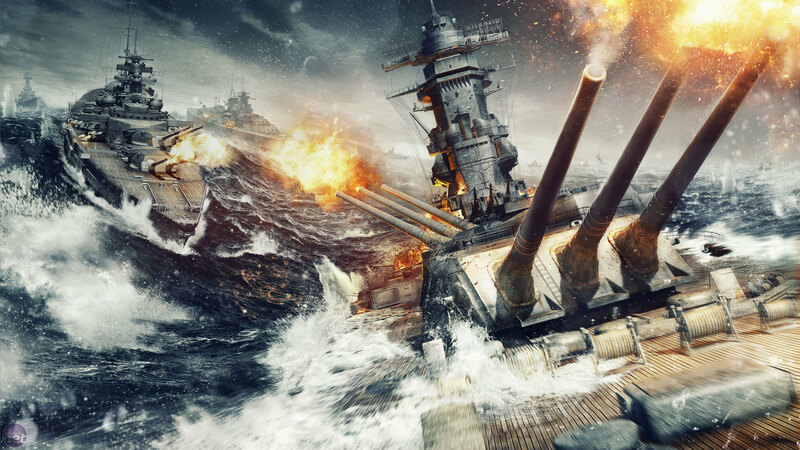 In some cases, a tank in World of Tanks is only as big as a single battleship turret, and maps are 100 miles square – a necessity when you're dealing with ships that can pummel targets 40 miles away. As a result, Wargaming has had to take some creative license with movement speed, as otherwise some ships would take over an hour to go from corner to corner, which isn't an option for 15 minute rounds. Nevertheless, it's hard to notice this discrepancy in gameplay. Each team is formed of various vessels of different classes. So far we know of heavily armed battleships, speedy cruisers ideal for reconnaissance, torpedo-equipped and heavily armoured destroyers and giant air carriers. The WASD keys are used for navigation, but you can also bring up and plot points on your navigation map to plan and execute manoeuvres, leaving you free to get on with downing ships. Wargaming has thus far done a good job in conveying ship size, as you really feel it when you navigate the waters, so planning manoeuvres is important so as to not leave your vast self exposed. Maps do have cover, in the form of islands, and smoke screens can be deployed as well, but there's plenty of treacherous open water to contend with too. The various weapons systems are intuitive and easy to familiarise yourself with, and the distance that you can zoom into further drives home the sheer scale of everything. Each vessel type of course has its advantages and disadvantages. For example, hitting a target with all four of a battleship's main calibre guns will deal massive damage, but requires you to be side on to your targets, exposing your weak points. Skill and accuracy are thus crucial, as guns can take 30 seconds to reload, so missing a shot is bad news indeed – it took us a fair few tries before we could reliably hit a moving AI target, and human opponents won't be as predictable. Torpedoes also have trade offs. For starters, they move slower than airborne ballistics, but deal more damage, so accurately predicting where a target will be is even more important. You fire multiple torpedoes at a time, and you can either spread them over a wide angle to increase your hit chance (but mostly likely reduce the number that hit), or, if you've a sure shot, narrow the angle, reducing the chance of a successful strike but with the reward of massive damage if you pull it off.